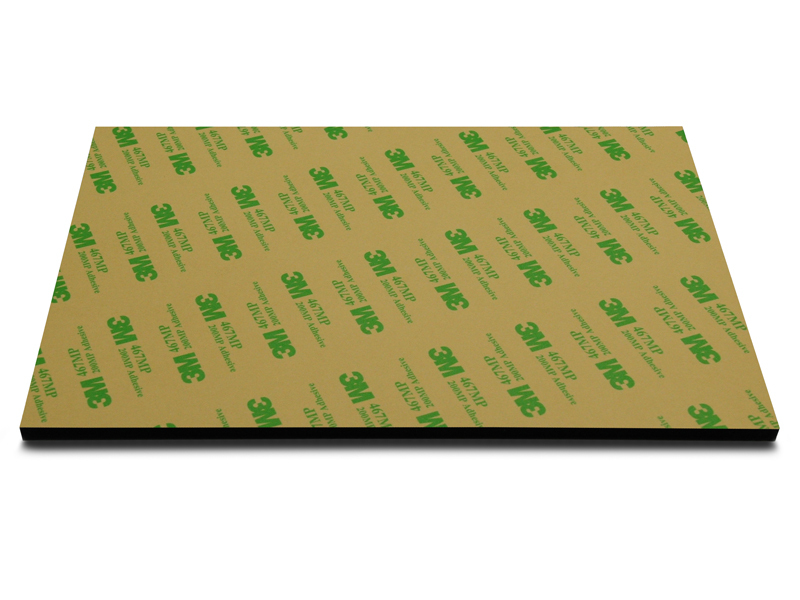 3M 3M Microcellular Polyurethane Foam products consist of a thermoset, microcellular PU foam with or without an adhesive backing. These products exhibit good cushioning, sealing, and vibration control due to very low compression set properties. However, the open cell structure allows gas and vapors to pass through the material. When lined with 3M adhesives, this product provides high initial tack and excellent shear strength over a wide temperature range. These foams were designed for high performance gasketing and sealing application, but also find applications in automotive, aerospace, electronic, and medical industries for the purposes of sound dampening and vibration control. 3M Polyurethane Foam is produced in 15 lb/ft3 (240 kg/m3) and 20 lb/ft3 (320 kg/m3) densities and in thicknesses from 0.0625" (1.59 mm) to 0.5 (12.7 mm). It is available without adhesive or with a variety of adhesive thicknesses, carriers, and liners. All 3M PU foams are black in color. A relatively low density and thermoset chemistry are the key factors that makes 3M Polyurethane Foam easy to process with DLMP (Digital Laser Material Processing) technology. How this property influences the results of DLMP is discussed in detail in the following sections. 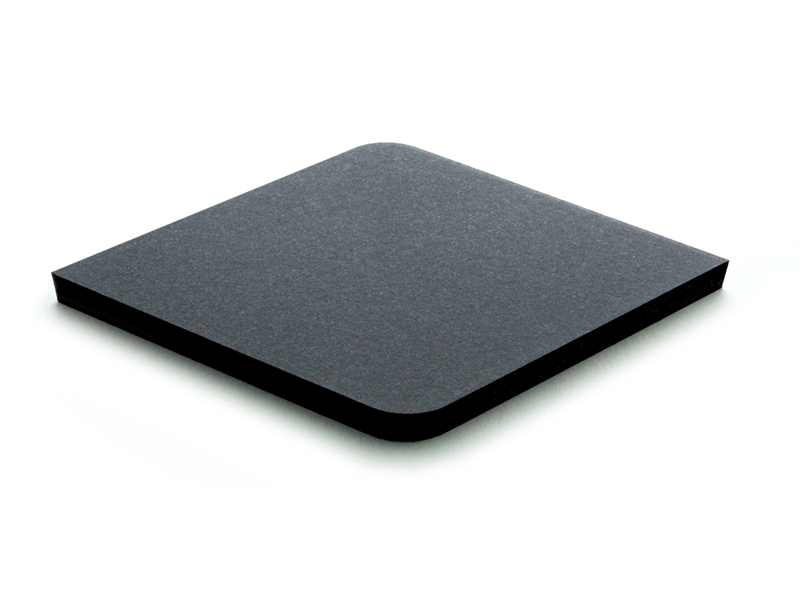 The most useful effect of laser energy with 3M Polyurethane Foam is material ablation. 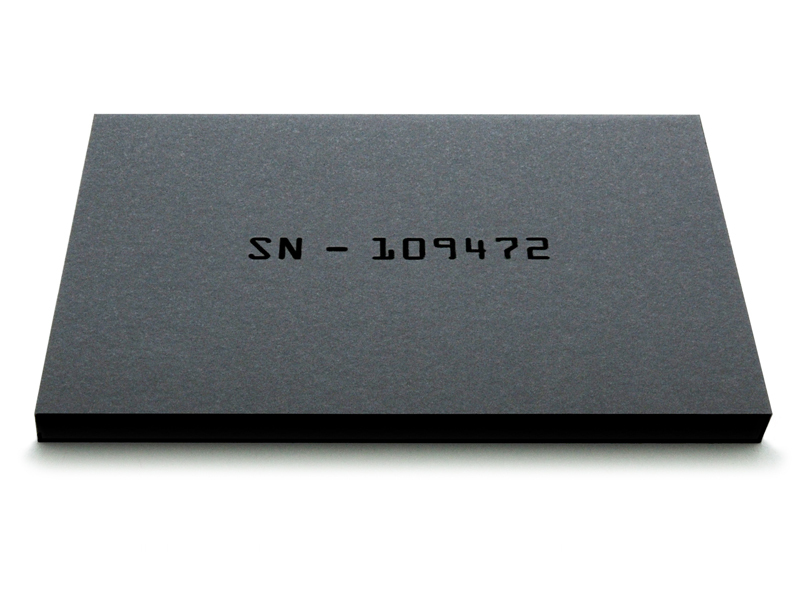 In the case of 3M Polyurethane Foam, the processes of laser cutting and laser engraving apply. Each of these processes are discussed in their respective section below..
Material ablation is a physical process that removes material. Material is removed completely from the top to the bottom surface or partially from the top of the material down to a specified depth. Polyurethane is an excellent absorber of CO 2 laser energy (wavelength=10.6). When polyurethane absorbs laser energy, it rapidly converts optical energy into molecular vibrations (heat). Because this type of polyurethane is a thermoset, sufficient heat leads to rapid chemical decomposition. Material directly in the laser path is cleanly ablated away into vapor and fine particles. For these reasons, CO 2 lasers are commonly employed for laser ablation of polyurethane foam. The material just outside of the laser's spot or path will conduct some heat, but not enough for complete and thorough ablation. This area of thermal affect is often referred to as the heat affected zone or HAZ. In the case of 3M Polyurethane Foam, virtually no HAZ is created because the low density foam structure does not require heavy heat loads to cut or engrave. Additionally, the polymer is a thermoset, so it can withstand heat without melting. Due to its high service temperature and low density, 3M Polyurethane Foam ablates cleanly from the bulk material. The edges that result from laser cutting are smooth and free from discoloration sometimes associated with thermal processes. This is demonstrated in the top example with a 0.25 inch (6.35mm) thick diamond shape laser cut from 3M Polyurethane Foam. 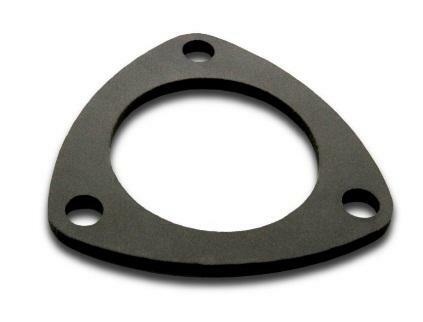 Laser cutting this product produces very little debris and can be used as-is in most cases. For thicker sections, a wet cloth may be used to wipe away any solids. The basic capability shown can be extended to nearly any shape, even complex and closely-spaced cuts. When used with an adhesive liner, partial cutting is also possible. Partial cutting is a type of selective cutting whereby the top layer of material is ablated through, but the bottom layer is left intact. This is possible because the laser can be precisely modulated over the entire work area. The next three images show an example of how a partial cutting process can be applied to 3M Polyurethane Foam. The foam and adhesive of the desired shape is peeled away while leaving the liner intact. .
Laser engraving is the process by which material is removed from the top surface down to a specified depth. This is possible due to tight control over laser modulation. By continuously varying the laser power, laser engraving can be used for textures, photographs and information, such as text and numbers. The example shows how the laser energy can be controlled to remove material to a controlled depth. 3M Polyurethane Foam can be engraved cleanly without discoloration or melting for the same reasons it can be cut cleanly. When the laser energy is used to produce a human- and/or machine-readable identification or information on a material, such as a barcode, date/lot code, serial number or part number, the process is considered laser marking with depth or laser depth marking, although it is essentially engraving into the material. 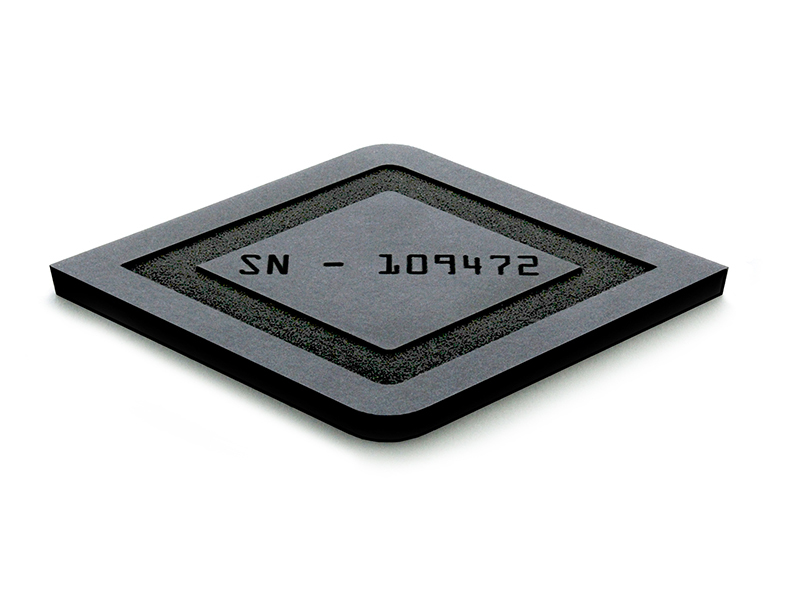 The example image shows a serial number on 3M Polyurethane Foam using laser depth marking. Multiple processes can be applied to 3M Polyurethane Foam without having to move or re-fixture the material. 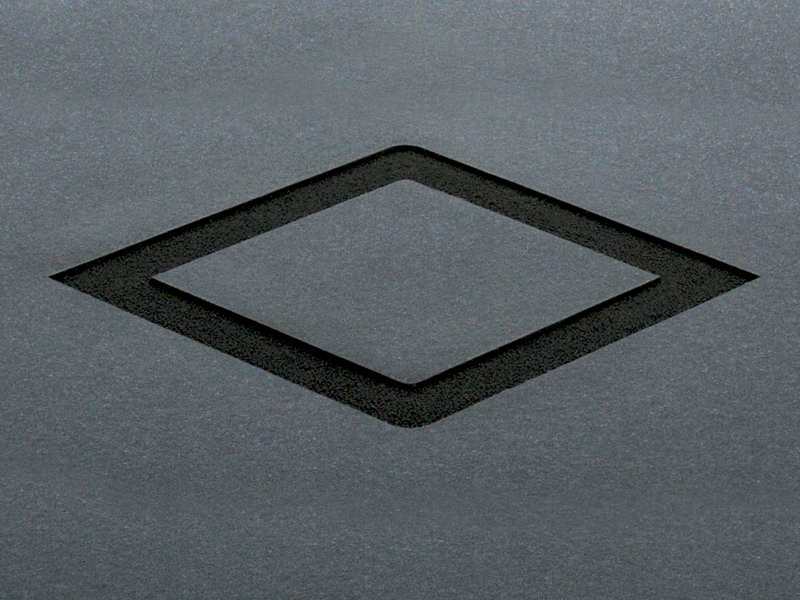 The image demonstrates how processes can be combined to cut 3M Polyurethane Foam from sheet stock, engrave a diamond shape into the material and engrave a serial number. Laser material interactions almost always create gaseous effluent and/or particulate. Because this product is based on a thermoset polymer, the material will chemically degrade into methyl carbamate rather than melt or boil. Gaseous phase effluent is generated as well and most made up of carbon monoxide. These gases and particulate should be routed to an exterior environment in accordance with government regulations. Alternatively, the effluent can be treated with a filtration system first and then routed to an exterior environment. Some materials have a propensity to generate flammable by products during laser processing. Therefore, laser processing should always be supervised.